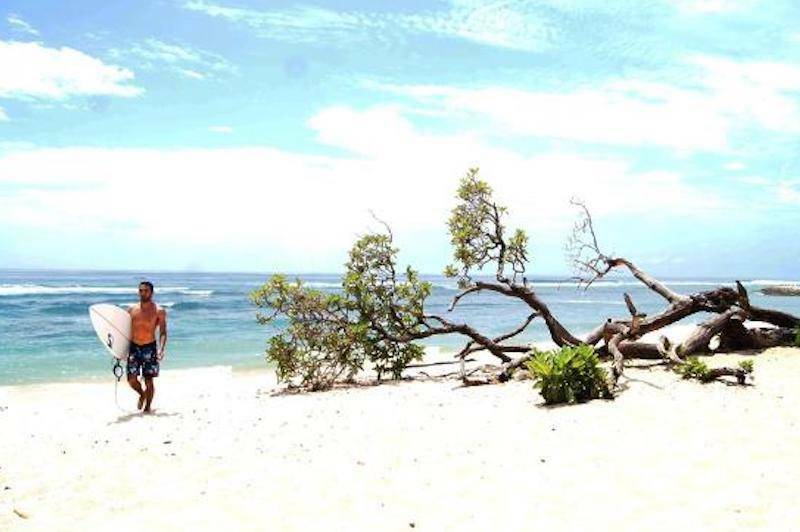 Sawangan Beach is a location on Bali where you can create long-lasting memories. Thousands of beach lovers are visiting this place every year and many of them are going to Sawangan Beach Bali. As the name suggests, this shoreline is situated in Nusa Dua in the famous Sawangan-Benoa district that is part of South Kuta. Conveniently located in the south, this attractive, sandy beach is a real magnet for both tourists and local visitors. The white sand and the warm waters are perfect for every type of beachgoer. Today, Sawangan Beach is used by many people for different purposes. The northern part is used by fishermen while the other parts are used for sunbathing. The water of this beach is crystal clear and due to the fact that there are many waves, this foreshore is visited by surfers too. The specific terrain of this shoreline and the area around it makes it a little bit difficult for surfers. If you are interested in spectacular surfing sessions, then you should look for another option. This area it's special for romantic pictures. Yet, if you love swimming then you’ll enjoy Sawangan Beach Bali. 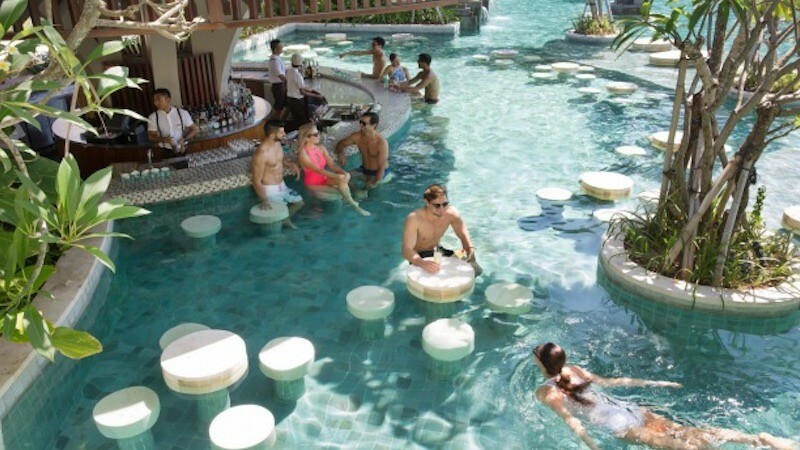 There is also a famous Hotel Hilton where you can take a drink and use the magic pool if you want to. 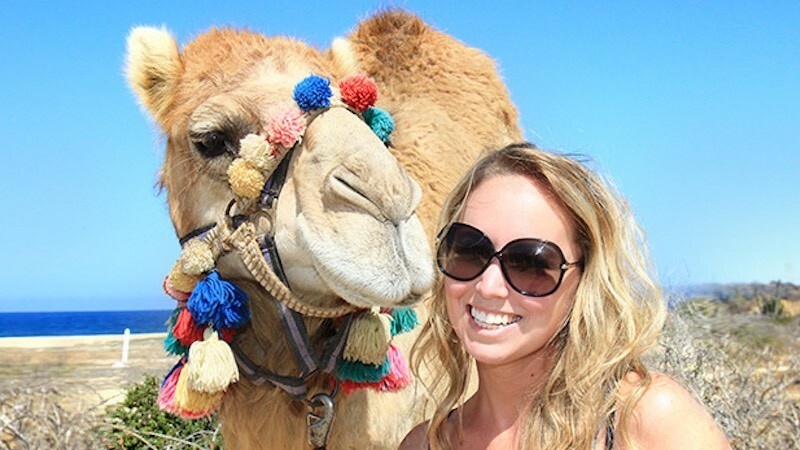 Additionally, many people are taking a tour with Camels on this location. Needless to say, you can visit local bars and restaurants, more things to do in Sawangan. While you are there you can visit the sacred area which is part of the famous Balinese temple of Pura Dalem Karang Boma. You can taking sunbath on the foreshore and on the hotel Hilton, you can even rent a sun lounger and swimming on this quite shoreline if you want enjoy. The Beach Sawangan greatly increase your comfortability and safety in the water. 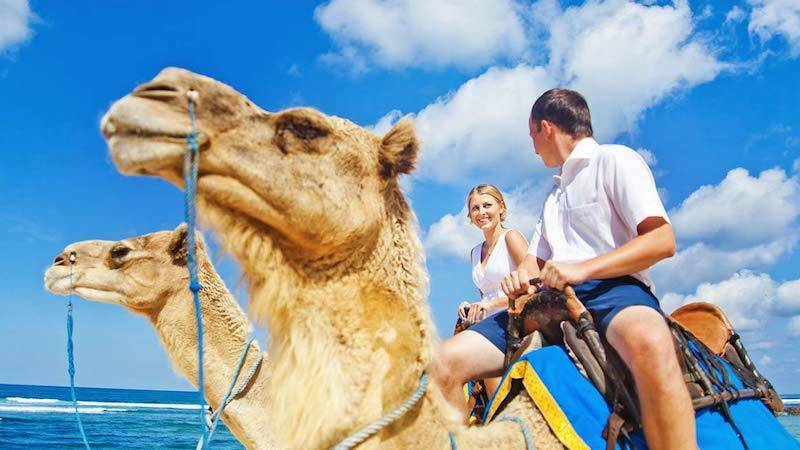 If you are new to Camel Tour, have no worries! 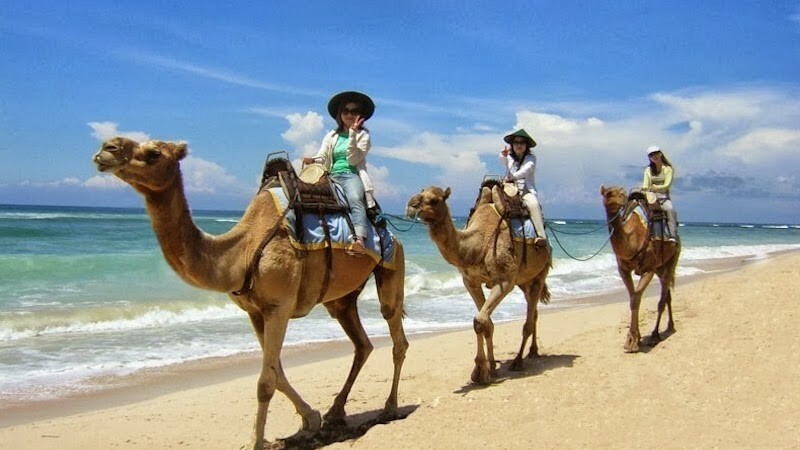 You can rent this tour with guide and no worries, this camels are really quiets and is not a porblem take a tour for all Sawangan shoreline. Typical for a couples in love or families. The swimming pool of Hotel Hilton in Sewangan is a public pool, and everyone can visit it. 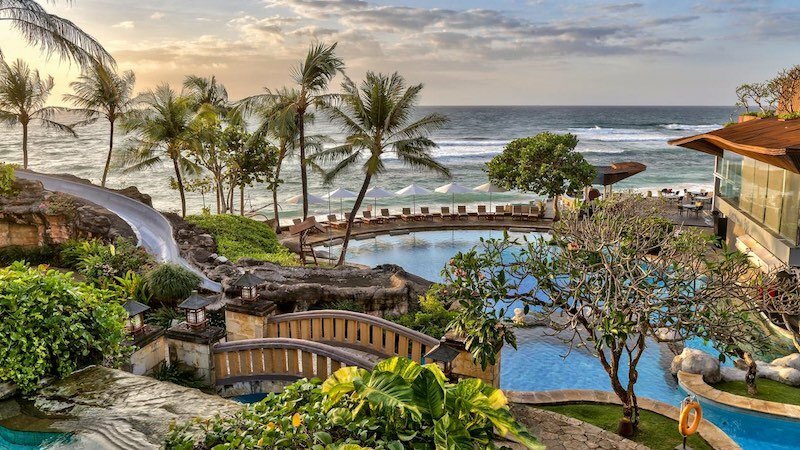 Unlike the private beaches of the hotels in Nusa dua. It is a quiet swimming pool to refresh your mind, body and soul. Enjoy the pool and take a drink. Sawangan belongs to an area which has a tropical climate. In Sawangan Beach Weather, for those who didn’t know, a tropical climate is characterized by warm weather and stable temperatures regardless of the season. The only thing that is changing here in terms of weather elements is the rainfall. There is a distinctively dry and wet season. Remember!!! is all about sunbathing, swimming and enjoy your holidays. It would be best to visit it during the dry season which stretches from April to August. People have been visiting the island for decades and as a result of its popularity, we can find many different types of accommodations here. 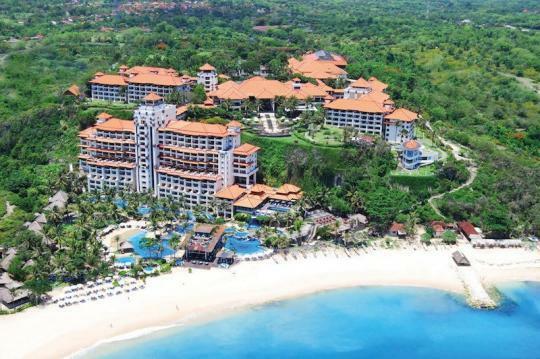 As one of the leading foreshore in Bali, Sawangan and the nearby area are filled with some luxurious hotels. 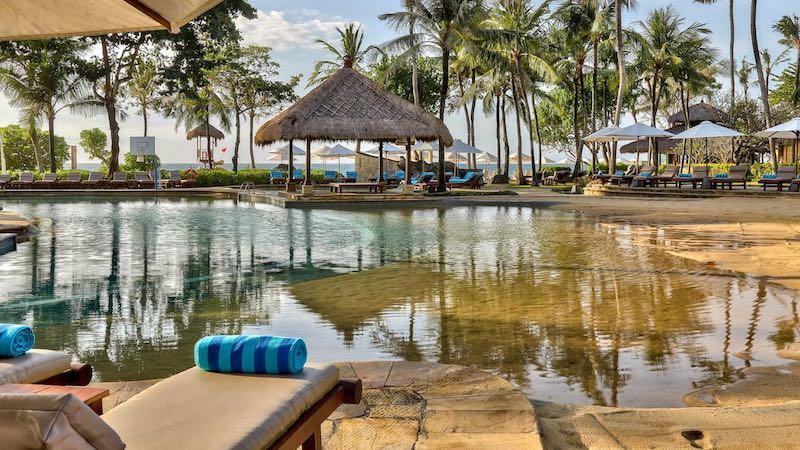 For instance, just a couple of hundred of meters from the shoreline, you can find hotels that belong to famous hotel chains like Grand Hyatt and Hilton Bali Resort. There are many resorts in this area, but there are also many lodges, homestay options, apartments for rent and other solutions for tourists with small and big budgets. A simple online research should provide you a wide array of options that you can use. Keep in mind that the prices are different in different periods of the year. We have already mentioned this foreshore is situated in the southern part of Bali. You can see that on any Sawangan Beach map. Getting to this place is actually quite easy. You will have to follow the Jl. Gunung Payung I road, a paved road that will make you stop at Hilton Hotel. There is a huge parking space and a few access points. You can get a taxi and get there too. Some people are using boats. Even walking is an option for some travelers. When we take all these things into account, we can confirm that this area is yet another Bali beach that is worth checking.